In addition to our custom duck calls we also have handmade custom turkey calls. 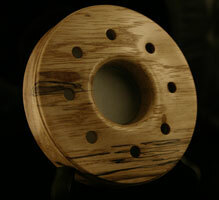 These pot calls use a variety of friction surfaces including slate, glass and or aluminum in various combinations. 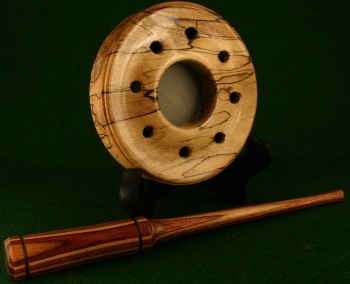 Each pot call comes with a one piece turned striker matched to the call. 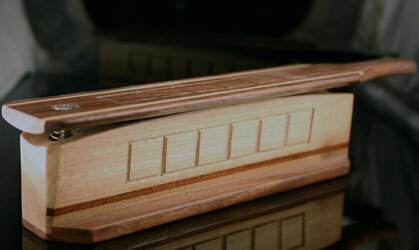 Striker materials include bodock, bubinga, sapele, Dymondwood and African Blackwood. I pride myself on the select woods used and the fit and finish of these calls. Just the right sound to bring that old tom right in. The calls you see on this page are the actual calls available, click on the call photo for a larger photo. As with all of our calls these come with an unconditional money back guarantee if you are not satisfied for any reason. Description: This is an acrylic stabilized, spalted sycamore, double sided pot call with Bronze glass over glass playing surfaces. Comes with a Dymalux striker.